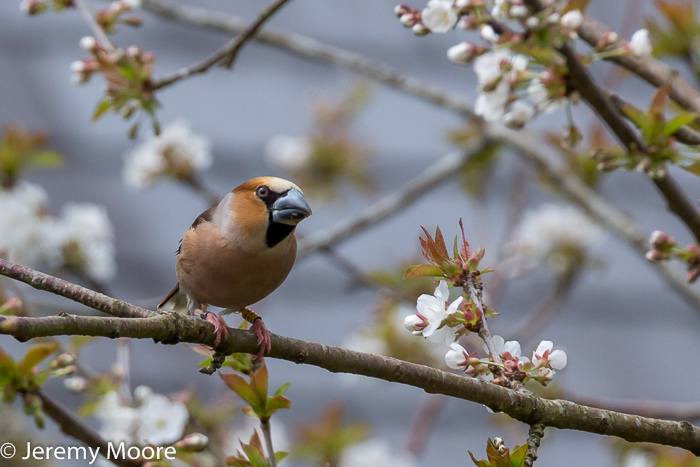 A couple of years ago I posted about photographing hawfinches in a Welsh churchyard. (See this post). While it was exciting to come back with something usable it was not really the image of my dreams. So I kept my ear to the ground about other possible locations. The hawfinch has always been an uncommon bird in the UK and has become increasingly scarce in recent years. In 2013 the maximum number of breeding pairs remaining in the UK was estimated to be one thousand. The 2013 BTO Bird Atlas noted that the Welsh population was becoming increasingly significant in a UK context. And – unlikely as it may seem – it has become more and more apparent over the last few years that one north Wales town is the British hawfinch hot-spot. The first hint of this came in 2004, when research published in “Welsh Birds” suggested a breeding population of about fifty pairs in the area, and a wintering population of more than a hundred birds. The increasing scarcity of the species and its growing presence in the area has resulted in further ringing and other studies being undertaken there. Both the BTO and the RSPB have become involved. The results have shown how numerous the species actually is there and how little we knew about the hawfinch! Ornithologist Dave Smith and bird-ringer extraordinaire Tony Cross have set up a feeding station in woodland nearby which is kept well-stocked with sunflower seeds. Hawfinches can rely on this food source all year round and there they can be netted, ringed and released. The yellow plastic leg-rings, each with an individual letter and number combination, can be read relatively easily in the field. Perhaps the most astonishing information has come from just one garden in the leafy outskirts of the town. Shortly after moving into the house, inexperienced bird-watchers Trevor and Chris ******** began to notice some unusual-looking birds on their feeders. Delving into their field guide they realised they were hawfinches. Their garden has since developed into a hub of hawfinch-related activity. Trevor and Chris themselves have become, by their own admission, obsessed with the species. They sit in their kitchen and read ring numbers with a telescope. To date they have identified 185 different birds, with probably an equal number of un-ringed individuals. It really is hawfinch nirvana. Thanks to my contacts in BTO Cymru Trevor and Chris very kindly agreed to let me visit their garden to do some photography. Trevor has himself taken many excellent photographs of the hawfinches through their kitchen window and posted them on Flickr. But there is no mistaking the fact that they are all taken at bird feeders. Not really the type of setting I felt they deserved. Tony Cross generously took me to his feeding site but the setting there is, if anything, less attractive. It is an extensive carpet of sunflower seed shells surrounded by ringing paraphernalia. We tried scattering seeds on the woodland floor around the “feeding table” but the birds just weren’t interested. Perhaps I should have been more patient…….. But there is a cherry tree in the ********s’ garden and the hawfinches sometimes perch in it before heading for the feeders. That sounded more promising! There followed a wait of several weeks for it to come into bloom and leaf. The strong northerlies of late April and early May held back flowering even longer than usual. Last Sunday the tree finally began to show some colour and it was amazing how much change there was in the following 24 hours. I chose a position in the garden where I could look across to the cherry tree against a dark background. For the first time in my life I set up the tripod, brought out the camping chair, sat down and draped a bag hide over myself and all my gear. It took a bit of getting used to. Apart from the issue of physical comfort, tunnel vision was a problem. I could hear birds all around but often not see them. The lower branches of the cherry tree were visible but the lawn and bird-tables were out of sight. But when a hawfinch lands it has the tendency to sit tight for a few seconds and survey its surroundings. There is sometimes an air of deliberation about their activities. They seem to take their time and think things through. So on the few occasions when one did perch in the cherry tree I had the chance to catch it in a variety of postures and compositions before it dropped down onto the feeders. Light cloud was preferable to bright sunshine as it tended to illuminate tree, flowers and bird in a gentle, even light, and cast no shadows. I’m absolutely thrilled by this image. NB I have removed Trevor and Chris’s surname to maintain their privacy, and also the name of the town. This entry was posted in Uncategorized and tagged bird, hawfinch, photography, wales. Bookmark the permalink. 4 Responses to In hawfinch nirvana. Rightfully thrilled Jerry, beautiful shot. Still haven’t seen a UK hawfinch though the scopes periodically converge on Cromford churchyard for that very reason. Great they’re doing so well round Dolgellau. Thanks for the comment. Do keep in touch. Worth the discomfort, Jerry, all good things and all that..